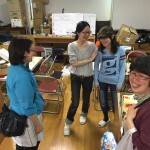 This time the English report, about our first outreach after the Kumamoto disaster (which took place from 25 -29 April), took longer than I planned. But, better late than never (with apology)! The earth quake disaster has created countless new opportunities for the church, of ministering to people with very real needs. In a country with less than 1% Christians, the church is mostly “invisible” in the community. Most Japanese people feel uneasy, uncertain and sometimes even somehow hostile toward the church / Christians. But the number of people crossing the entrance of RCJ Kumamoto during our outreach, exceeded that of the normal attendance over many months’ worship services. Relationships that were initiated are waiting to be developed and deepened. Local church members need consistent prayers, encouragement and concrete leadership from various sources. Hundreds of people have had contact with the body of Christ for the first time ever. Therefore, after we finished our outreach, another team followed-up with a second outreach (between 9-13 May). One of those team members even stayed behind until today. From tomorrow Tobie and Annalie De Wet will also visit and serve the congregation and community, until May 25th. And after that, for the next four weekends, four pairs of our seminary students (studying at KRTS – Kobe Reformed Theological Seminary) will reach out and assist the local pastor and his wife with many new ministry responsibilities. I will also join this again from 17-20 June. 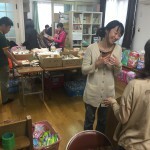 Now – as with the tsunami in the Sendai in 2011 – the local church has her first opportunity of becoming more visible and more actively ministering to others in the community. With the assistance of Mission Japan’s supporters, in conjunction with the wider RCJ (including Shikoku Presbytery), as well as KRTS, we are staying involved in this crucial time for this small RCJ church. Read more here below … for a comprehensive feedback on our first outreach, as well as for more photos. And please keep us all – who are involved in the outreaches, as well as the local church and community of Kumamoto – in your prayers. In the area surrounding the congregation physical damage is little, compared to certain other parts. But the emotional wounds are clearly visible. The vulnerability of children and the aged is especially clear. 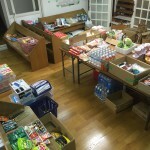 For the past three days a steady stream of people came to the church for essential supplies such as water, food, gas cans (to prepare food with) etc. Some fetched diapers for babies, others canned foods. These are being made available for free through the support of other RCJ congregations. 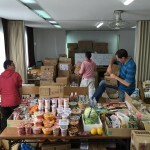 Other goods were collected for free from an interdenominational Christian support centre which had been founded for emergency relief. Mission Japan’s funds were e.g. used to pay for our team’s travelling expenses and meals, as well as toys for children who came to the church (they needed entertainment as schools were closed until 9 May); and essentials for the church itself e.g. small fold-up tables, book shelves for the children’s room etc. It was done to create a welcoming space for people, in order to feel comfortable and at home, amidst enormous stress. Reserve funds will be transferred to the RCJ to be utilized in the long term for further outreaches, relevant support projects etc. The church across the whole world is making a meaningful, concrete difference in this crisis, which is tremendously encouraging for the local Christians. Three theology students and I helped to prepare and equip the church as a place of support. 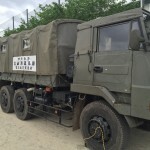 Offloading and organizing, as well as distribution of essential emergency goods, all formed part of our responsibilities. Two students focused especially on playing creative games with the children that arrived at the church voluntarily. Another student (that had been a nurse before) did some basic medical check-ups for people on request, at the same time discussing at a deeper level their emotional wellbeing. I shared actively in all the above-mentioned activities, and focused especially on listening to people’s deeper emotional needs. There were many opportunities to do this. Most people to whom I talked had a great need to debrief. Many also repeatedly wanted to share their experiences, to find some sense of de-briefing and meaning-making in all the shock and stress. Themes that surfaced constantly revolved around the enormous disruption that left people anxious and uncertain. Many families are temporarily separated, because e.g. many men / fathers spend the nights at their places of work. (for safety’s sake and to help clear the chaos). Mashiki town was struck the worst, and many people there are living in tents. The army provides only in the most basic of needs, for the people there. One aged gentleman was overwhelmed with joy over the canned foods and sweets for children he had been given, while visiting the church. Although the most urgent needs of most people have been met e.g. sustenance, water and safe refuge, there are many other (less noticeable) needs mentioned in discussions. By endeavouring to listen more intensively to people I could sometimes discern the actual cause of the need and anxiety, and I tried to give them support and to establish ties with local church members (for longer term follow-up care). Rev. 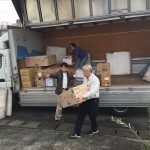 Nishibori took essential items to church members that had been isolated by the disaster. He was also involved with other church members whose relatives’ homes had been totally destroyed. His main focus was especially on the church members, whereas our focus was on people who came to the church for the first time for assistance / support / goods. He and his wife were flooded with correspondence with the wider church etc. 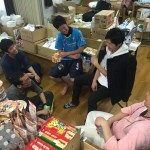 They still feel somewhat overwhelmed by all the events, and will take a break to rest (away from Kumamoto) early in May. I also had the opportunity to pay a visit to one family from the congregation, and was able to have a long and meaningful pastoral discussion with them. One man talked about his struggle to get his three children (and two cats) out of his house in time as they feared that it might collapse. His eldest daughter had psychological problems (panic disorder), and now finds it hard to sleep. As the big earthquake struck at night she is now terrified of the dark. They keep on all lights and the TV at night, because silence and darkness intensify her anxiety. She doesn’t sleep at night, but she does so in the daytime. She stays indoors all day, has not been outside the house for 10 days, and schools open only in 2 weeks’ time. The stress is sometimes unbearable, her father said. His need to share and to be heard is clear. His own place of work (company building) was situated in one of the hardest hit areas, and collapsed (at night). Another lady (whom I got know here in October last year), came to talk to me a number of times during the week. After the disaster she had learned what it meant to live and to die, she told me, because when she now opened her eyes in the mornings, she was profoundly relieved to find herself still alive. She told me with wide open eyes about the gigantic hole that had suddenly opened up in the parking area surface directly behind their car (because of the earthquake). She and her family were now prepared for any following disaster, emergency kit ready at the front door, blankets in the car in case they might have to spend a night there again. A mother of three infants (used to be a nurse) shared how frustrated and tired she was having slept so little during the previous 10 days. 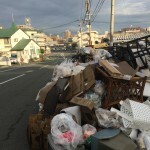 They had actually moved to that area a year before, as they used to live close to the tsunami disaster area (Sendai), and had experienced intense trauma. She had intended to stay at the church only for a few minutes but eventually she – with her 3 daughters – stayed for lunch and talked to us continuously for hours. A number of times she mentioned that it was wonderful that the church had now in this way become a restful place where one could feel at home in that chaotic time. Her children no longer needed to sit frustrated in front of the TV all day, but could play at the church, and relax in a healthy manner in a safe, friendly environment. 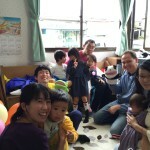 Her words touched me deeply, as this had long been my dream for the church in Japan … that it would become more and more of a home for those people that feel increasingly uprooted and displaced in their daily lives. A refuge that is also an open, welcoming place, peaceful, and happy. She also freely asked me about the church and about faith issues, including the “darkness” in her life. Another group of women talked about teachers, that were also victims themselves, who had to work extremely hard at schools which were used as temporary shelters for thousands of people. A principal suffered from severe emotional ‘burnout’ in the process. Members of the armed forces also worked continuously to bring about emergency relief. That these conversations occurred at the church is noteworthy. It places the church in the centre of the community, and the community in the centre of the church. Rev. 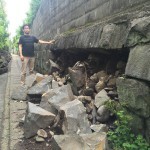 Nishibori shared with us about his own and his family’s trauma of the past few days. On the day of the earthquake a number of strange things had occurred, he recounted. He was extremely tense getting his sermon done (for that Sunday), as a number of unexpected events had occurred, e.g. a long drawn-out involvement with a homeless person, an hour’s crisis phone call etc. Shortly before the earthquake struck he had gone outside the church to put up his theme for that Sunday’s sermon: (“The Signs of the End of the Age” from Mark 13). The earthquake struck shortly afterwards. 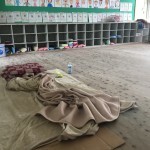 They had fled for shelter (school grounds) after the second severe quake in the middle of the night. In one corner of the school grounds, water (to everyone’s great shock) had started gushing from the earth. 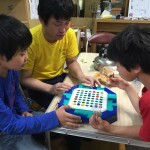 He and his wife, and their six-year-old son had stayed in the shelter for about a week. He witnessed how the Lord had provided people at the right times to support and encourage them. When they had been able to return to their home, and came to their senses, Psalm 46 (especially verses 1-3,10-11) spoke profoundly to him … “Be still, and know that I am God, I will be exalted among the nations.” The same test I had read and discussed at KRTS on more than one occasion, before we came to Kumamoto. At the prayer meeting which we could share with the students, Ester, one of the students, shared an encouraging message from 1 Peter 1:3-9. 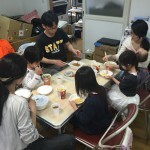 Her and here family’s lives had been severely affected by the huge 1995 earth quake in Kobe, during which their home had been destroyed. Her testimony focused on verses 6-9, from which, she told us, she had learned that no suffering was ever meaningless. Through faith it is purified, and becomes meaningful. Crises such as these actually expose the foundations of our lives and faith! 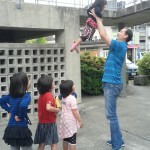 I am most grateful for the opportunity of being part of the outreach, within the first two weeks after the earth quake. This is a time during which needs and circumstances change easily. In these circumstances I think the composition and gifts of our outreach team suited well to a great extent. All of us had been involved in the 2011 Tohoku disaster (Sendai region). It was possible for us to involve ourselves immediately in and be effective within the church’s initiatives. The pastor (Rev. Nishibori) had been here for only two years, and was still developing relationships of trust with church members and residents of the area. A new era has opened for the small congregation. How will the Lord provide in this crisis, and transform this tiny religious community into a hopeful sign of his love and care? We do not know, but we have (again) experienced a small part of the new direction in which the church was hauled into by this disaster. I am grateful to have had the opportunity to be allowed into the very private (holy) places of people’s lives and to hear their stories of fear, powerlessness and despair. We pray that the following outreach projects will in the long term help to create an “openness” of the church for the community. So that people that have never been in a church nor have had any close contact with Christians before, will find it easier to be able to “come inside”. We believe that it presents new, unique opportunities to share the gospel of hope in Jesus Christ. At one stage a group of young boys walked past the church. We invited them to enter, but they were on their way to a game of soccer, and proceeded on their way. The next day they (a group of 15) arrived unexpectedly at the church. Enjoying themselves, they played at the church for a considerable length of time. Not a single person that crosses the entrance of the church, is regarded casually, as a matter of course. It stays exceptional, within the context of the Japanese community, for non-Christians to take a courageous first step into a church. There were especially certain people that came repeatedly during our time there, people with whom the congregation might get involved more deeply. We pray for this. 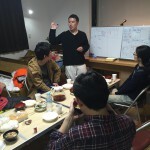 As RCJ Kumamoto is a small congregation (about 20 church members), it is important not to over-stretch the local congregation’s capacity, and to consider responsibly the medium and long term involvement and possibilities. 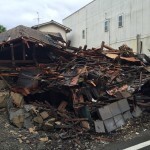 While I was writing the last words of this report, the building shuddered as a result of another after-shock … the uncertainty is in no way over yet, but the steadfast, living hope of Jesus Christ (1 Peter 1:3) brightens up Kumamoto. Please pray with us for the next phases of support in the light of the information above. God’s Peace, and thank you once again for everyone’s support! Die aardbewing rampgebeure skep talle nuwe geleenthede om konkrete nood en behoeftes van mense vanuit die kerk te bedien. In ‘n land met net 1% Christene is die kerk meestal moeilik “sigbaar” in die gemeenskap. Meeste Japannese mense voel ongemaklik, onseker of soms selfs op ‘n manier vyandig teenoor die kerk / Christene. Maar die getal mense wat in die afgelope 3 dae oor die drempel van RCJ Kumamoto gestap het (terwyl ons hier was), is meer as wat in maande se eredienste hier bymekaar kom. Die verhoudings wat begin bou is, wag om verdiep te word. Die plaaslike gemeentelede het volgehoue gebede, bemoediging en konkrete leiding uit verskeie oorde nodig. Honderde mense het vir die eerste keer ooit met die liggaam van Christus te doen gekry. Nou – soos in 2011 na die tsoenami in Sendai – het die plaaslike gemeente die kans om meer sigbaar en aktief diensbaar te raak in die gemeenskap. 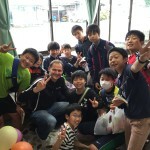 Met behulp van Missie Japan se ondersteuners, in samewerking met die breër RCJ, asook die Kobe Kweekskool, sit ons spesifieke uitreik projekte voort. Lees hier onder meer … vir volledige terugvoer oor ons eerste uitreik. En sien foto’s. Luister ook gerus na ‘n onderhoud (met my) hieroor op RSG se Sondagjoernaal, eerskomende Sondag 1 Mei tussen 07:00-08:00. Baie mense bly in parkeerplekke, in hulle motors (omdat hulle huis onveilig is). Produkte in winkels word vinnig uitverkoop, veral vars produkte is skaars. In die omgewing van die gemeente is die fisiese skade gering teenoor sekere ander dele. Maar die emosionele wonde is helder sigbaar, en daarby kon ons vir ‘n kort tydjie betrokke raak. Die weerloosheid van kinders en bejaardes was veral opvallend. Daar was die afgelope drie dae ‘n aanhoudende stroom van mense wat kom na die kerk vir lewensmiddele soos water, kos, gaskannetjies (om kos te maak) ens. Party ma’s kom haal doeke vir kinders, ander blikkieskos. Die middele is verniet beskikbaar gestel deur die ondersteuning van ander RCJ gemeentes. Daar is ook goedere (gratis) afgehaal by ‘n Christelike ondersteuning sentrum wat gestig is vir noodverligting. ‘n Deel van Missie Japan se fondse is bv. gebruik ons span se reiskostes en etes te betaal, asook om speelgoed vir kinders te koop wat by die kerk kom speel (hulle soek afleiding omdat skole gesluit is tot 9 Mei); asook noodsaaklikhede vir die kerk self bv. opslaan tafels, boekrakke vir kinderkamer ens. Dit is gedoen om ‘n vriendelike ruimte te skep vir mense om in tuis te kom t.m.v. groot stres. Die oorskot sal aan die RCJ oorbetaal word om op die langtermyn te gebruik vir verdere uitreik projekte, toepaslike ondersteuningswerk ens. Die kerk regoor die wêreld maak ‘n betekenisvolle, konkrete verskil in hierdie krisis, en dit bemoedig die plaaslike Christene geweldig. Ek het saam met drie kweekskool studente gehelp om kerk in te rig as ‘n plek van ondersteuning. Die aflaai en regpak, en verspreiding van noodmiddele was o.a. deel van ons werk. Twee studente het veral gefokus op kreatiewe spel met kinders wat spontaan by die kerk opgedaag het. ‘n Ander student (wat voorheen ‘n verpleegster was) het ook basiese mediese ondersoek gedoen vir mense wat dit verlang het, en daarmee saam dieper gesprekke gevoer oor hulle emosionele welstand. Ek het aan al die bg. deelgeneem, en veral ook gefokus daarop om aktief te luister na mense se dieper emosionele nood. Daar was vele geleenthede om dit te kon doen. Dankbaar! Die meeste mense met wie ek gesels het, het ‘n groot behoefte gehad om te “de-brief”. Baie van hulle wou herhaardelik vertel wat hulle beleef het, om self sin te maak van die skok en stres. Tema’s wat pal opgeduik het in gesprekke, het gesentreer rondom die geweldige onwrigting, wat mense beangs en onseker laat. Baie families leef nou tydelik apart, bv. omdat baie mans/pa’s by hulle werkplekke slaap (t.w.v. veiligheid en om die chaos te help opklaar). Mashiki gebied is die ergste getref, baie mense woon nou daar in tente. Die weermag bied net baie basiese middele. In dié dae het ‘n ou man daarvandaan gekom, en hy was oorstelp van vreugde om blikkieskos en lekkergoed vir kinders te kon ontvang. Alhoewel die dringendste nood van meeste mense verlig is i.t.v. kos, water en veilige skuiling, is daar vele (minder sigbare) behoeftes wat na vore gekom het in gesprekke. Terwyl ek dieper na mense probeer luister het, kon ek soms hoor waar die eintlike nood en angs lê, en probeer om daarin te ondersteun, asook om ‘n verdere band met die plaaslike lidmate te bewerkstellig (vir langer termyn opvolg sorg). Nishibori het noodsaaklike items geneem na gemeentede wat geïsoleer is deur die ramp. Hy was ook betrokke by ander lidmate wie se familie-lede se huis totaal verwoes is. Sy fokus was veral op die gemeentelede, terwyl ons fokus op die mense was wat vir die eerste keer na die kerk gekom het vir hulp / ondersteuning / middele. Hy en sy vrou is oorval met korrespondensie met wyer kerk ens. Hulle voel nog oorwelidig deur die hele gebeure, en sal volgende week vir 3-4 dae (weg van Kumamoto) gaan rus. Ek het ook die geleentheid gehad om ‘n besoek te doen aan een gesin uit die gemeente, en kon ‘n lang en sinvolle pastorale gesprek met hulle voer. Een man het vertel van sy geskarrel om sy drie kinders (en twee katte) betyds by die huis uit te kry omdat hulle beangs was dat dit inmekaar sou tuimel. Sy oudste dogter het sielkundige probleme (panieksteuring), en sukkel nou vreeslik om te slaap. Omdat die groot aardbewing in die nag gebeur het, is sy nou doodbang vir die donker. Hulle hou alle ligte en die TV aan in die dag, want stilte en donker verhoog haar angs. Sy kry nie geslaap in die nag nie, maar wel in die dag. Sy wil nie by die deur uit nie, is al 10 dae in die huis, en skole open eers weer oor 2 weke. Stres is soms onuithoudbaar, vertel die pa. Sy behoefte om te deel, en om gehoor te word, is duidelik. Sy eie werkplek (maatskappy gebou) is geleë in een van die dele wat die swaarste getref is, en het ineengestort (genadiglik in die nag). ‘n Ander vrou (wat ek verlede jaar in Oktober hier leer ken het), het die week ‘n paar keer met my kom gesels. Ná die ramp het sy geleer wat dit beteken om te leef en sterf, vertel sy, want wanneer sy nou in die oggende haar oë oop maak, is sy diep verlig as sy besef sy is nie dood nie. Sy vertel met groot oë van die reuse gat wat ewe skielik in die aarde oop geskeur is net agter hulle motor in die parkeer area. Sy en haar huis is nou slaggereed vir ingeval van ‘n volgende ramp, noodsakkie gereed by voordeur, komberse in kar vir ingeval hulle weer daar moet slaap. ‘n Ma van drie kleuters (voorheen ‘n verpleegster) deel hoe gefrustreerd en moeg sy is nadat sy die afgelope 10 dae baie min geslaap het. Hulle het as gesin juis ‘n jaar gelede hiernatoe getrek, nadat hulle voorheen naby aan die tsoenami rampgebied (Sendai) gewoon het, en deur groot trauma is. Sy het gedink om ‘n paar minute by die kerk te bly, maar uiteindelik het sy en haar 3 dogters saam met ons middagete geëet en vele ure onophoudelik gesels. Sy het ‘n paar genoem hoe wonderlik dit is dat die kerk nou op die manier ‘n plekkie kon word waar sy kon tuiskom te midde van ‘n chaotiese tyd. Haar kinders hoef nou nie meer heeldag gefrustreerd voor die TV te sit nie, maar kan by die kerk rustig speel, en op ‘n gesonde manier ontlaai in ‘n veilige, gasvye omgewing. Haar woorde raak my diep, want so droom ek lankal oor die kerk in Japan … dat dit meer en meer ‘n tuiste sal word vir dié wat ontwortel en ontheem voel in hulle daaglikse lewe. ‘n Oop, verwelkomende ruimte vol geborgenheid, vrede en vreugde. Sy het my ook vrymoediglik uitgevra oor kerk en geloof, en oor die “donker” in haar eie lewe. ‘n Ander groep vroue gesels oor onderwysers wat self ook slagoffers is, en baie hard moet werk by skole wat tydelike skuilings vir duisende mense moes word. ‘n Skoolhoof het emosioneel feitlik uitgebrand in die proses. Weermaglede werk ook onverpoos om nood-verligting te bewerkstellig. Dat hierdie gesprekke gebeur by kerk is noemenswaardig. Dit plaas die kerk in die middel van die gemeenskap, en bring die gemeenskap se nood midde-in die kerk. Nishibori het met groot erns vertel van sy eie en hulle as gesin se trauma van die afgelope dae. Op die dag van die aardbewing het ‘n paar vreemde goed gebeur, vertel hy. Hy was baie gespanne om sy preek (vir die Sondag) gedoen te kry, want ‘n klomp onvoorsiene goed het gebeur, o.a. ‘n lang, ingewikkelde betrokkenheid by ‘n boemelaar, ‘n uur-lange krisis telefoon-oproep ens. Kort voor die aardbewing gebeur het hy sy preek te tema (“Oor die tekens van die eindtye” uit Markus 13) buite te kerk gaan opsit. En juis tóé tref die aardbewing kort daarna. Hulle het in die middel van die nag gevlug na skuiling (skoolgronde), na die tweede groot skudding. In een hoek van die gronde het water (tot almal se groot skok) begin uitspuit uit die aarde. Hy en sy vrou, en hulle ses-jarige seun het vir ongeveer ‘n week in die skuiling gebly. Hy het getuig hoe die Here het regte mense voorsien het om hulle op die regte tyd te ondersteun en bemoedig.Toe hulle uiteindelik kon terugkeer na hulle huis, en tot verhaal kom, het Psalm 46 (veral verse 1-3,10-11) diep tot hom gespreek … “Bedaar en erken dat ek God is, hoog bo die aarde, hoog bo die nasies.” Dieselfde gedeelte het ek ook by meer as een geleentheid gelees en bespreek by die kweekskool, voor ons koms na Kumamoto. By die biduur wat ons saam met die gemeente kon deel het Ester, een van die kweekskool studente, ‘n bemoedigende boodskap/getuienis gedeel, 1 petrus 1:3-9. Haar eie lewe is diep geraak deur die reuse 1995 aardbewing in Kobe, waarin hulle huis vernietig is. Haar getuienis het gefokus op verse 6-9, waaruit, vertel sy, ons leer dat geen lyding is nie betekenisloos nie. Deur geloof word dit gesuiwer, en kry dit betekenis. Krisisse soos hierdie lê inderdaad ons lewens- en geloofsfondamente bloot! Ek is baie dankbaar vir die geleentheid om te kon uitreik binne die eerste twee weke na die aardbewing. Dit is ‘n baie vloeibare tyd, waarin die behoeftes en omstandighede vinnig verander. In hierdie omstandighede, dink ek, het ons uitreikspan se samestelling en gawes tot ‘n groot mate baie goed gepas. 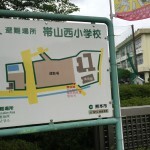 Almal van ons was betrokke by die 2011 Tohoku rampgebeure (Sendai omgewing). Dit was onmiddelik vir ons moontlik om in te skakel en toepaslik betrokke te raak by die kerk se inisiatiewe. Die predikant, ds. Nishibori is nog net twee jaar hier, en bou dus nog aan vertrouens- verhoudinge met lidmate en mense in die omgewing. ‘n Nuwe era word oopgebreek vir die klein gemeentetjie. Hoe sal die Here in die krisis voorsien, en die klein geloofsgemeenskap in ‘n hoopvolle teken van sy liefde en sorg omskep? Ons weet nie presies nie. Maar ons het wel (weer) iets ervaar van die nuwe wending waarin die kerk geslinger is deur hierdie ramp. Ek was opnuut bewus van die groot voorreg om ingelaat te word in baie private (heilige) spasies van mense se lewens en verhale van vrees, magteloosheid en wanhoop aan te hoor. Oor opvolg-projekte: die tweede groep studente van die kweekskool sal 9-13 Mei uitreik. Ds. Nishibori (predikant by RCJ Kumamoto) het ook versoek dat Tobie (ds.) 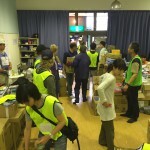 en Annalie de Wet die gemeente en gemeenskap kom bedien van 22-25 Mei (as deel van Missie Japan se werk hier). Ons bid dat hierdie uitreik projekte op die langtermyn sal help om die gemeenskap “oop te maak” vir die kerk, én die kerk vir die gemeenskap. Sodat mense wat nog in ‘n kerk was en nog nooit met Christene van nader kon kontak maak nie, nou makliker kan “in kom”. Ons glo dit bring nuwe, unieke geleenthede na vore om die hoopvolle evangelie van Christus te kan deel. Opvolgwerk in die kerk se nabye omgewing is volgende op die agenda. Veral om by mense aan huis te gaan aanklop om te hoor watter behoeftes daar is, en hoe daar ondersteun kan word. Op ‘n stadium het ‘n groep jong seuns verby die kerk gestap. Ons het hulle ingenooi, maar hulle was oppad om te gaan sokker speel, en het verbygehou. Die volgende dag daag hulle (groep van 15) toe onverwags by die kerk op. Hulle het lank en lekker by die kerk gespeel. Nie een persoon wat oor die kerk se drempel stap is vanselfsprekend nie. Dis uitsonderlik binne die konteks van Japan. Daar is veral sekere mense wat herhaaldelik in die drie dae gekom het, en met wie die gemeente ‘n verdere pad kan stap. Ons bid daarvoor. 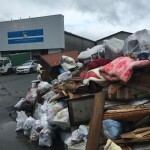 Omdat RCJ Kumamoto gemeente klein is (ongeveer 20 lidmate), is dit belangrik om nie die plaaslike gemeente se kapasiteit te oorskry nie, en verantwoordelik te dink oor medium en langtermyn betrokkenheid en moontlikhede. Die De Wets se besoek is in daardie opsig baie tydig (later in Mei) en nodig. Terwyl ek die verslag se laaste woorde neerskryf, ruk die kerkgebou van nog ‘n na-skok … die onsekerheid is geensins verby nie, maar die onwrikbare, lewende hoop van Christus (1 Petrus 1:3) het verhelder in Kumamoto. Bid asb. saam met ons vir die volgende fases van ondersteuning, in die lig van die bg. inligting. Vrede, en weereens dankie vir elkeen se ondersteuning!